Castleford’s run of victories that saw them shoot up the Hunters ECB Yorkshire Premier League North table is beginning to look a distant memory after they were heavily beaten by Sheriff Hutton Bridge. The decision to bat first backfired badly on Castleford as they were soon reduced to 19-3, with key player David Wainwright one of the men out, and they never recovered. Connor Hyde, with 15, was the only batsman to reach double figures and three players got ducks as Cas were bundled out for just 51. Yorkshire’s Karl Carver (3-5) and fellow spinner Dulash Udayanga (3-9) shared the last six wickets at a cost of just 14 runs. Castleford recorded the second lowest total in the competition’s history so it was no surprise that their visitors needed only 10 overs to complete a nine-wicket win with Udayanga adding an unbeaten 28 to his earlier effort with the ball. Castleford seconds went down by four wickets to Cawood in the Hunters York Senior Division Three Ebor. In a rain reduced contest, Castleford recovered from 18-4 to reach 124-6 when their innings was ended in the 45th over. Matthew Clegg top scored with 47 while Nigel Ling hit 22 and David Young 20 not out. 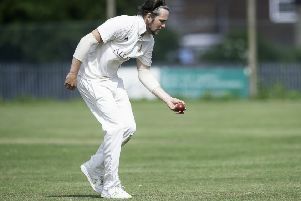 Cawood reached their target for the loss of six wickets in the 31st over despite 3-40 for Jack Young and 3-45 for Martin Gibson.